I used to tie a bath towel around my neck and pretend to be Superman. I would climb onto the kitchen table and jump, then run around on the floor with outstretched arms, flying off to save the world. We didn’t have a movie camera, so I’m left with only dim memories of how ridiculous I must have looked. Then my Aunt Josephine gave me a real Superman costume for my seventh birthday. I remember unwrapping the box and seeing the big red S shining through the clear plastic. Everyone was there: my parents, cousins, brothers, and sister. And so I did the only thing that made any sense. I kissed my aunt, then picked up the costume and ran to my room. I stashed it under the bed and went back downstairs. They all wanted to know why I’d run off without putting the costume on. I shrugged my shoulders. Was there any point in trying to explain to these unenlightened relatives, these non-readers of comic books? Superman didn’t take off his pants in front of other people. Nobody got to see him change into his uniform. He did it out of sight, or at a speed too fast for the human eye. If my family wanted to see a superhero in their own home, they’d have to wait until they weren’t expecting it. That was how it worked. Saving the world was a goal that developed over time. At first, I had identified the need to protect only my loved ones. There was one late spring day in particular. My sister was almost a year old, my brother was two, and I was four and a half. We lived on a regular street, one of hundreds that formed the basic grid of Bronx neighborhoods. The stores and restaurants were on White Plains Road, a few blocks away. We called it “The Avenue.” It’s where we went to get a slice of hot pizza for ten cents, or have an egg cream at the candy store under the elevated train tracks. Across the avenue from the candy store was the newsstand run by the man with no eyes. We’d been told repeatedly to avoid staring at him, but it was impossible not to look hard every time. He wasn’t just a blind guy. He had no eyes. If you were just blind, there was always some possibility that enough people would pray for you and your sight might come back. But without eyes, you wouldn’t have a chance because who was going to spend time praying for such an unlikely miracle? (Besides, would he have any idea we were staring?) I remember how focused he was on finding the right magazine, or making change. He knew where everything was inside that stand, and he moved quickly. He felt the coins with his ink-stained fingers, distinguishing nickels from quarters without fail. I never knew how he could tell a five-dollar bill from a one, but I suppose he relied on the honesty of others and his own intuition. The trains rumbled overhead every few minutes. The newsstand sat under the stairs that led up to the tracks. It was one of the great spots of my childhood, this place of legs moving in every direction, of hot pizza and egg creams and roaring trains and fresh newspapers and crisp magazines, and this eyeless man with blackened fingertips and so many honest customers. I marched along the curb, peering ahead for any trouble that might be lurking up the block. It seems absurd to think of a skinny little boy keeping his family safe from speeding Chevrolets and wild animals on leashes. But I believed even then that it was my job to protect. Fortunately, it was 1960. The Bronx had its violence, though not the kind that threatened children and young mothers. That would later change, but we would be across the Hudson by then. Meanwhile, I could live out my early Superman fantasies. We walked to the avenue hundreds of times, and always made it back safely. The x-ray glasses turned out to be a major disappointment, as did nearly every other piece of junk I got from the Johnson Smith Company. In retrospect, I now know it was the anticipation I was paying for. Weeks of deliciously unbearable excitement culminated in the arrival of a package addressed to me, which I tore open in a fever, like a mountain lion disassembling a rabbit. Inside, always, was a small plastic item that bore little or no resemblance to the high-tech marvel pictured in the ad. Needless to say, the x-ray glasses did not allow me to see through walls, clothing, skin, or anything else. In fact, it was pretty hard to see through the x-ray glasses themselves. Superman had other powers, of course. He could travel back in time by flying really fast in the opposite direction of the Earth’s rotation. One of my original goals was to go back to the 1960 World Series, when the Yankees lost to the Pittsburgh Pirates on Bill Mazeroski’s home run in the ninth inning of game seven. I intended to purchase a hypnotizing disk and several canisters of itching powder from the Johnson Smith Company, then sneak into the Pirate clubhouse, put all of their starting pitchers to sleep, and use the powder to give them each a terrible rash on some sensitive part of their body. My alternate idea was to order some of those books and learn how to beat up Bill Mazeroski. Then I remembered that I didn’t really know how to fly. One night I was in bed trying not to fall asleep. My parents were in the next room watching the news on television, and at some point I heard my father say, “They’re going to blow up the world one of these days.” He must have been voicing his concern about the growing tension between the United States and the Soviet Union. I thought he was talking about a definite plan, as though the American military had decided to destroy the Earth. We’d been learning about the end of the world in religion class, when flames would consume the planet and Judgment Day would arrive. I had begun trying to figure out where a person could hide when the entire world was on fire. Then we were told that the cafeteria at school was a bomb shelter. What would that be like, I wondered: surviving a nuclear attack, but having to eat those school lunches for the rest of my life? By the time I was nine years old, I already understood that the world was a dangerous place. My father was afraid. Even Superman was powerless. My supplier of magical devices and secret weapons turned out to be a company whose principal marketing strategy consisted of ripping off little kids. I missed those innocent days of youth, when I was happily leaping from the kitchen table with a bath towel tied around my neck, and safely guiding my family across the frontier. And the blind man’s image is also so clear, I can almost see his stained fingers and feel his deliberate movements. The aroma of the goodies in the candy store wafts through my screen, too (though I’d like to know what egg creams are). I remember wondering if the blind man had family of his own, if he had people who watched out for him. I drove past that same corner this afternoon, and the newsstand is gone. I’ll probably always be curious about what became of him. Egg creams were nothing like what they sound like. Most were just seltzer and chocolate syrup; some places added milk. I think I drank them because my older brothers did. Thanks, Priya. I appreciate your superhuman-ness, too. I pinned a towel around my neck and then attached my Hoppalong Cassidy belt around my neck looped around the banister and jumped. The next thing I remember was my mother beating me with the big wooden salad spoon(all Italian mothers have this weapon and that’s just what is was because it was never used for salad and never touched a single leaf of lettuce) while I was screaming and choking at the foot of the stairs. I think my disappointment with life and the beginnings of 59 years of depression began when I heard the actor/superman committed suicide. I could rationalize that Superman was an actor playing the REAL Superman because the real Superman could not have time to make TV movies as he was too busy fighting the bad guys. I soon put together that the real and the actor were indeed the same Superman and this was another fraud perpetuated by adults on children just like Santa and the Easter Bunny and the dopey Tooth Fairy who was such a tightwad leaving just 15 cents for your tooth. Another disillusionment. Your whole mouth was worth just a cheezy 3 bucks. Now I am a skeptic and a cynic and my innocence is lost because there is no superman and there never was a super man and the world needs Superman so desperately. They have not take everything, however. There still is Peter Pan and Zapata is hiding in the mountains planning the next revolution. Oh yeah. Mother is 88 and still has the salad spoon. I agree with you that the world could use a little super help. But it’s not going to happen and we all need to figure out how to take care of ourselves, and each other, before it’s too late. I think we will. Meanwhile, try to avoid that salad spoon. That was like watching a movie. I can just picture your guarding everyone while walking down the street. I wanted to be Isis for awhile. Remember the Shazam/Isis hour? So cheesy looking now that I look back. I had her saying memorized and just knew one day if I concentrated hard enough while saying it I was going to be able to fly. I remember wanting X-ray glasses and would have been very jealous of you and begging to borrow them. My parents wouldn’t let me order them. Maybe they were afraid they worked. I watched an episode of Superman a few months ago, and couldn’t believe how lame it was. But you would have known immediately that those X-ray glasses were cheesy. If you don’t believe me, the company is still around. I wonder what the glasses cost now. My brother also had a Superman costume. I had not yet arrived on the scene, but he received the gift when he and my mother and father lived in Greenwich Village. He still wells up recounting the day he wore the costume down West 11th Street, patrolling the block for the safety of our family and the neighbors, and promptly got beat up by some villainous teens. I’m so glad you didn’t meet the same fate in the Bronx. But, maybe having had the sense not to morph into Superman in front of your family, you had the same good sense not to strut your costume clad super hero stuff down the street. Great post, Charles! That must have been traumatic for your brother. I wish I had been there with him; then we could have gotten beat up together. Thanks, Blud. I always appreciate your comments. Egg creams! You’ll probably have to explain them to a bunch of people. I know I did when I went away to college. Were they just a New York thing? We used to make our own at home. We had a soda man who delivered cases of soda and the seltzer in the blue bottles with the silver handle. (I hear those old bottles are worth money). We’d buy U-bet chocolate syrup and whip up frothy egg creams. A pretzel on the side, and all was right with the world. You could have been talking about my childhood with the “Avenue” and the train overhead, but I was in Queens. I chewed lots of Bazooka gum and mailed in the comics that came inside the gum for equally pathetic prizes. I don’t know if egg creams were a New York thing, but I think they were. We had the same wooden cases of seltzer delivered in the blue bottles. And you’re right: the Bazooka prizes were very pathetic, and produced that same sense of disappointment. The strangest part is, I miss it all, and I bet you do, too. I know I’ve told you your stories remind me of the amazing book “A Girl Named Zippy” by Haven Kimmel, but now I’m convinced. You, Haven, and I need to meet and in a most powerful trifecta of literary genius and imagination that makes up for whatever we lack, and take over the world!!! Muahahaha! Or save it, whatever floats your boat. I used to play with bath towels too, only I pretended I was Sleeping Beauty (before she falls asleep) and would sing in my driveway and talk to animals. I don’t remember ever pretending to be a superhero myself, I preferred to be an orphan. However, I did make up stories about my amazing superhero team of friends which was a conglomeration of all my favorite female cartoon characters. My super-team was made up of Rogue and Storm from X-Men, The Invisible Woman from Fantastic Four, Sailor Moon, and Dot from Reboot. I think taking over the world is a good plan. I’ve always wanted to do that, but it would be more fun as a team. Once we’re in control, then we can save it. I have one or two people I’d also like to invite to join the group. I really enjoyed this. It brought to mind one of my favorite Kathy Mattea songs, written by Guy Clark, Susanna Wallis Clark, and Jim Janosky: The Cape. I agree. The cape alone is enough, while the rest of the uniform without the cape is just a pair of pajamas. Our age group was lucky enough to grow up with IMAGINATION as a revered aspect of our personality. For you, it obviously brought forth your talent to write. Think of all the kids today whose TV viewing lends to everything spelled out for them. And zero imagination. So very sad. Priya: Egg Creams are uniquely New York – and it has no egg, nor cream. They really can’t successfully be made at home because the critical ingredient is spray seltzer, from a soda fountain. Chocolate syrup and whole milk and soda. Yummmmm. Makes me want to head out and find one today. This sounds like what Superman should eat, EOS. It gets rid of all the kryptonite, I am pretty sure! And thank you also for telling me that I will have to visit New York to taste it. Another city in the burgeoning itinerary I have! Let me know if you do find an egg cream, EOS, but I have a feeling you’d have a hard time even finding someone who knows what they are. I’ll be in the city tomorrow and will make a point of looking for an Egg Cream – and taking a photo when I do find it. I did, EOS. And I did. Wow, that looks good. We just missed each other. But your “super-ness” is more than the image of man as protector and saver of the world. Your sensitivity, compassion, love of family, decency are super qualities – exhibited by too few in this world. It is a terrible thing to realize that one’s father is not so super, but he was because he was your role model, and a fine one at that. This series is marvelous, Charles. Your gift of subtle humor is priceless. Thank you, SDS. I think those are exactly the qualities you possess. I really appreciate your ongoing support and encouragement, and value your friendship as much as I enjoy your blog. I remember the ads for x-ray glasses, etc. in the back of comic books…I wonder why it was always boys who were sucked in by them? This piece is very topical in light of what’s been happening in our world the last couple of weeks…I wish your Superman cape would fix it! Excellent post, as usual, Charles! I’d never thought about it before, but that entire catalog was geared toward boys and the ridiculous things we found irresistible. Maybe there was a girls’ version, but I doubt it. I think what’s been happening in the world, except for the natural disasters, is another reflection of the things boys find irresistible. Things will improve when we grow up. Thank you, Wendy. It’s always great to hear from you. that would be my guess…. Looking back on it now, I would’ve settled for being able to see through those advertisements. Just a word to Carl – you missed something important here. A little boy with a big heart, full of love and a desire to protect others IS a superman. The sad part is that all too often, the world and its woes, can be kryptonite to that spirit. No mere human can save the world, but we can still do our part in our own world, with the cape that God gave us. Thanks for that, Jac. The circle of people you care for and protect is much larger than mine. You are truly a super-woman. Another inspired post, Charles. The pictures you paint with your words are so vivid and you have a gift for allowing your reader to peer into your world–whether it’s your current one or the one that lives on only in your memory. I always come away touched and reflective after I read your posts. Not only do you make this kind of exemplary writing look easy (we both know it’s not! ), but much of this blog serves as wonderful family history to pass along to Allison and Shaun. Thank you, B. I’m so glad we’re back in touch. And when I write about our high school years, I may be hounding you for some of those details. I’ll say it before someone else does….at least you didn’t fracture your arm in the process. I second what reader “Westchester Square” said. So very true. Thanks, EOS. I appreciate it. You talked about ordering things from comic books, which means you had to have ordered the sea monkeys like I did. Man, what a major disappointment that was; almost made me stop ordering stuff. But one could also order more comic books, and that’s where I put most of my money. That was also when you could tape coins in an envelope; they kind of frown on that now. I did order the sea monkeys. They were just tiny shrimp, weren’t they? I’m pretty sure they died in about an hour. And I’d forgotten about sending cash, but there weren’t too many other options. I don’t quite remember being one and in the carriage but I do remember our walks to the Avenue with mom when I was about 5. It was certainly very noisy and busy along the way, but I never felt nervous about it. 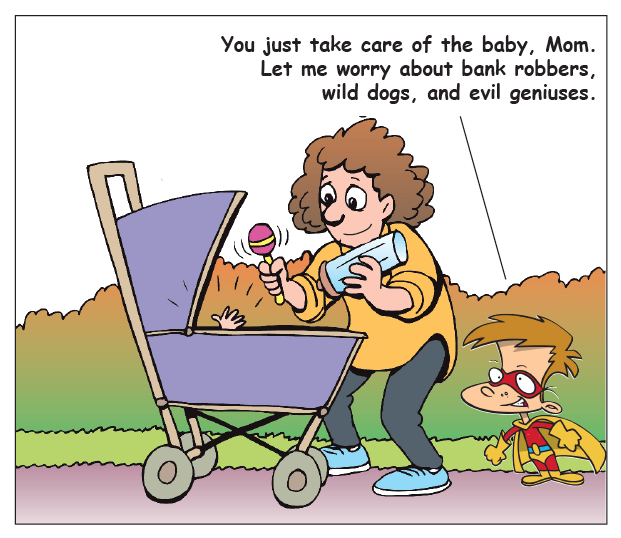 I always thought it was because mom was there – little did I know that Superman was watching out for me. Imagine that. I drove the neighborhood a few days ago. It’s changed a lot. Our old house looks the same, though. I love you, too! Did the mayor of New York know how lucky he was to have you covering the streets in the Bronx? Well, I just covered my few blocks. I’m sure there were hundreds of us. Thanks for reading, Amy. A fantastic read. I have always wondered why the boys liked their superman outfits, now I know. You have a great memory to be able to remember the events of your childhood so well, and very courageous of you to watch out for your family, just like superman. This post deserves 10 stars, that is of course 10 out of 10, I loved it. Just like everyone else, I have vast blank areas in my memory, too, so I focus on what I do remember. The superhero stuff was pretty important. Thanks, magsx2. I haven’t disappeared, and will be visiting your great blog again soon. There must be something about being the eldest sibling that promotes the protective gene. I share alot of these thoughts as I grew up. I know you had an older brother, but he was a much older brother and that sort of left you defacto-eldest on these outings. The Avenue sounds fascinating. I’ve seen many movies set in such locations and wondered what it would be like to grow up in such a place. Oh, and I bought the X-Ray glasses too and was just as disappointed. 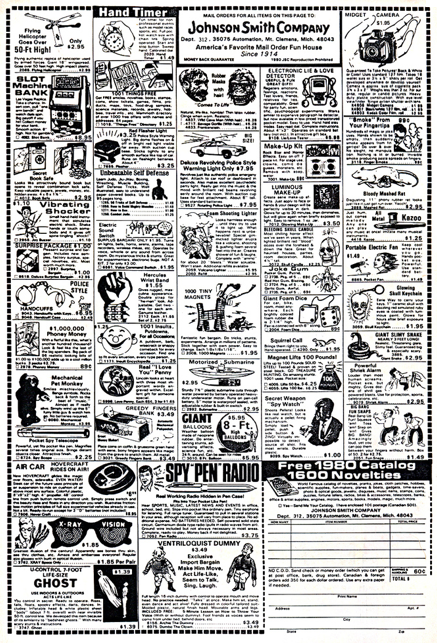 I was also disappointed in the super-hero decoder ring I sent for when I found out that all the “secret messages” were advertisement for breakfast cereal. What a gyp! Thanks for sharing, Charles; a pleasure to read, as always. Thanks, Allan. I think I got the decoder ring, too, but don’t remember that the messages were ads for cereal. I’m not surprised. As I’ve said before, and “Westchester Square” says again, I am so envious of the details and events that you remember from your childhood. I’m envious, but at the same time thrilled, because I am absolutely loving getting to hear these stories of your life. It makes me feel much closer to you, especially being so far away. It’s fun pushing my brain to really get in there and recall the details. I’m sure you could do the same. Writing about them seems to help. And I have plenty of memories of you when you were much younger. Let’s talk about them when you get back. You have probably heard this before but I nominated you for a Stylish Blogger and you need to pick up your award. Thank you, Rumbly. I’m flattered, but wonder if I should pass it on to someone else. There are so many great blogs out there that haven’t been honored. What a fantastic post! I love reading stories from your childhood–you must have been such a wonderful son and older brother. I’m not sure, Heidi. Maybe I’m just remembering it that way. I haven’t a clue what an egg cream is, but I want to try one after reading this! I feel like I’ve visited The Avenue in a Back To The Future kind of thing. I admire your Superman bravery and the way you told the story; it also reminded me of a time when 4 year olds didn’t have such a fear of the streets that they believed they could be protecters. I remember people being way more honest and friendly. That poor news guy wouldn’t stand a chance these days. This is definitely one of my favorite posts of yours to date. Keep em coming, Super-writer-man. We’ve definitely convinced our kids that they should be afraid. I wonder if, in our efforts to protect them, that we’ve also deprived them of something valuable: the freedom to be kids. Thanks for your encouragement, Jessica. This is reminiscent of “A Tree Grows In Brooklyn” but less ethnic and a smidge happier. Fun reading. That’s one of my daughter’s very favorite books. Thanks for the nice comment. I’m glad you liked the post. Just glad you didn’t break yourself while jumping off tables. What would we all have done without your tales of egg creams (never have gotten an explanation from you on this) and failed interventions on long-ago sporting events? And I know this doesn’t equate at all but I’m writing it anyway: The only superhero I really wanted to be was Tarzan’s “Boy”, not even sure why, or that this person was a superhero, but he was a jungle imp and got to swing around on vines. And play with monkeys. How awesome would that be? We hid under our desks, too. 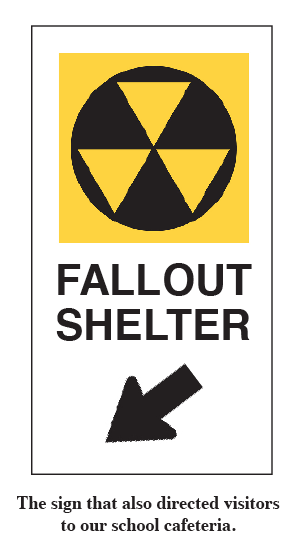 I think we used the bomb shelter once, with our parents, during an evening air raid drill. I don’t remember feeling reassured at all by the experience. Fun post! I wanted to be “Sheena, Queen of the Jungle” when I was about seven or eight. Living in So. Calif. in the late 1950’s gave me the opportunity to play out my fantasy in the orange groves at the end of our street. One day my mother got a phone call from a neighbor to alert her that I was coming down the street with a dead snake wrapped around my neck, followed by a gaggle of my admiring friends. My mother about had a stroke because she hates snakes. My Sheena episode was short-lived, to say the least. Thanks, TTPT. I don’t know what Premarin is for, and based on the dead snake story, I’m not sure I want to know. But it’s always great to hear from you. Yes, Linda, I was so much older then. Maybe the trick is to grow down instead of up, at least in some ways. A blind guy with no eyes. That’s quite an image. My dad is legally blind, but he can still see some; my uncle is pretty much completely blind. Watching them navigate their world without the vision that most of us take for granted is fascinating. Seeing how hard they have to focus to do even the simplest task makes me sad. Thinking about how vulnerable they are makes me want to protect them too. They still have their eyes, but even with all our super-modern technology and amazing medical advances no one has figured out how to fix them. I’m still thinking about the guy with no eyes, though, and wondering what would cause such a trauma. I’ve often thought about how I’d cope with blindness. I’m sure it would be a struggle, and I’d probably spend a lot of time feeling sorry for myself. Wouldn’t it be great if we could really appreciate the gifts we have, without having to lose them first? I never did learn what had happened to the man with no eyes, but I might be able to find out. It was a stark image — I can still see his face. Bill(y) – didn’t realize who you were but your comment about me helping when your cape didn’t work, was the tip off! Charlie – Bill jumped off the wall that lined the Pasquale’s driveway and broke his arm, when we were in 2nd. grade. Mrs. Cook assigned to me, the task of doing all of his writing in class. I think that’s when my crush on him began. It just made me realize that by the age of 8, I was already taking care of others, and falling for guys who needed me! Thank you both, for the strolls down memory lane. Wow. Ok, I get to use Charlie’s words here – Actually, Jac, I’ve never broken anything. (And I probably shouldn’t have said that.) I have fractured a few things though….. Since shoreacres quoted the Byrds, I’ll quote Buffalo Springfield – Expecting To Fly, just about sums it up. BTW, I always appreciated the help with the notes, but even they couldn’t save me from Mrs. Cook throwing me and my cast-encrusted arm to the floor in anger over a poor test grade. I would have never remembered the fighing though, I think it must have been more like wrestling, which was probably some pre-pubescent precursor to holding hands, in my warped mind. I don’t blame you for the change in heart of course, I was a weird kid. But….the crush, now that is a new one. I had no idea. I think I liked you when we were 13. I think in 2nd grade I liked Lynn Reinhardt (or was it one of the Denardo girls?) after that silly school play we were in. But with my friends at the time, it wasn’t cool to like girls. You’re one of the very few friends I still consider close after all these years. I remember that incident, but without much detail, and I didn’t know about the classwork or the crush. Or the physical fights. Why wasn’t I protecting you? Wow — what a special post. It’s amazing the moments that define us when we’re small. And how quickly we change, even from year to year, as you did between 7 and 9. I often wonder what bits and pieces will stick into my kids’ heads like your dad’s words about the world blowing up. It sounds like you had a great imagination, something you developed well into your writing talent today. The ability to see the special parts of the world where a Superman cape would be just the thing you’d need. My son today, who’s 4, showed his first assertion of protection regarding his little sister (she’s 2-and-a-half). He’s been a great big brother since she was born. But today at our playgroup, I gave out balloons. Each kid got a different color. And one of the other little girls tried to take my daughter’s balloon (totally innocent) because she wanted the pink one too. I’m an older sister. And for as long as I can remember it’s been born and bred into me to protect my younger sister. I read that in your post. And today I saw it emerge in my own little boy. It’s a special feeling, one that only grows as you get older, despite the other revelations of life, such as cheap 3-D glasses and the fact the world isn’t as safe as you thought. Or maybe that’s exactly why it grows. Ah, it’s coming back to me now….the boy with the balloon reminded me of it. One memory leads to another. I know it wasn’t real fighting because, props to Charlie, he was always watching over to make sure I didn’t get out of hand with you. Not unlike the boy with the balloon. Why isn’t there a television show about that street? Um, because there was already a comic book? And I did make a 8mm movie, the Lakeshore Drive Review, I think you were in it. Very goofy stuff, has probably decomposed by now. Thank you for the wonderful comment, happykids. I loved your description of your son as he stepped in to defend his little sister. I’m sure that’s a story both kids will want to hear over and over. Charlie, you were busy with all your high school activities and we didn’t hang out much in those days, unless we were playing running bases or pulling pranks on Kurt. Michael and I had the same circle of friends and I did always wonder why HE didn’t protect me. I guess because he and Bill were good friends back then, and when boys are 15, friends trump sisters. PS – I think we should write a show about the street, based on your comics “Life on Lake Shore”. They were classic! I completely forgot about those comic books. I wonder where they are. I always wanted to own some itching powder, only thing is, I was too shy and retiring a child to have used it! 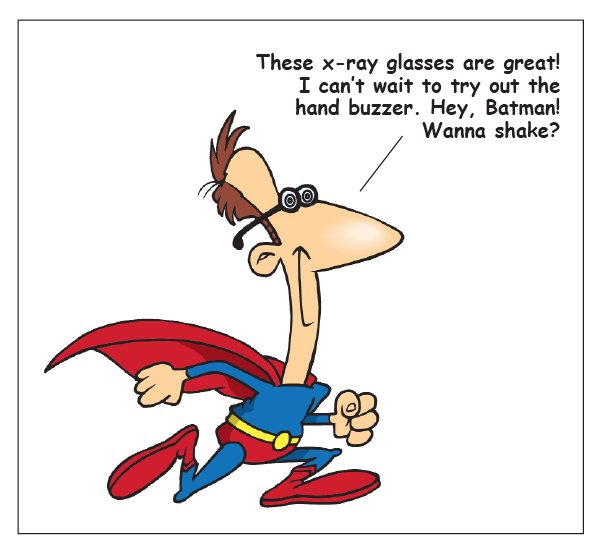 I do recall some x-ray specs…. useless, as you say. Though later I read a story – or was it a film? I think it was a film – that gave me the creeps about someone with x-ray vision and then stopped wanting a pair of xray specs! It’s curious, don’t you find, how we think of ourselves as children from two different perspectives? Inside, looking out, in which case we feel like we have always been adult – even at age three or four. Or outside, looking in, and seeing ourselves as adults considering an innocent child. I’m always slightly astonished at how you seem to blame yourself for having been ‘such and such’ as a child – from looking ‘ridiculous’ to anything else that you consider not quite right or in keeping with the world. Children aren’t ridiculous, they’re just children with their own personalities… some of that goes, some gets buried, some stays as we grow into adults. Much of mine has stayed. 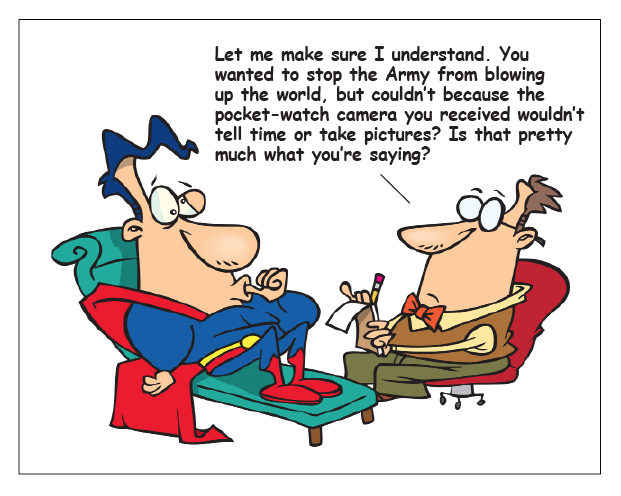 Yours has too – out it comes in these great cartoon captions and flows out through your posts! I’m trying to get a clearer view of myself, Val, much as you are. One way, for me, is to acknowledge as many facets of myself as I can identify. Some of those facets are pretty goofy; maybe ridiculous is a little strong, but that’s okay. I can handle it. (But thank you for wanting to protect me, and for your never-ending kindness — I appreciate your friendship).